Dry, cracked, damaged skin is not only uncomfortable, it can be an entry point for bacteria. 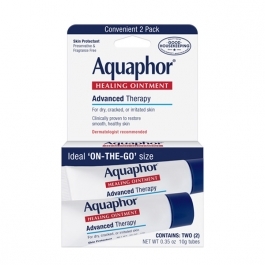 Aquaphor Healing Ointment is designed to soothe and moisturize damaged skin. It’s formulated to help support the body's natural healing process, helping skin to recover faster after injury. This dermatologist-recommended ointment can be used on cracked skin, chapped lips, cuts, burns, sensitive skin, or even skin that is irritated due to laser treatment or radiation therapy. Apply as needed. For diaper rash, change wet and soled diapers promptly, cleanse the diaper area, and allow t o dry. Apply ointment liberally as often as necessary, with each diaper change, especially at bedtime or anytime when exposure to wet diapers may be prolonged.